How Does Remote Entry Work? / Comments Off on How Does Remote Entry Work? Keyless devices allow us access to spaces in our home without having to dig through our bags for keys or put the grocery bags down. Remote entry to your garage is all about convenience, and allows you to lock and unlock the largest door in your home with ease, at the push of a button. A fob that can fit onto your key ring and unlock the door or disarm a home alarm system in seconds. A controller that can affix to your car’s sun visor. 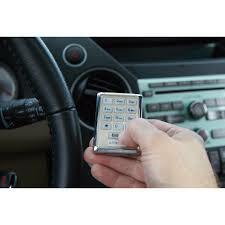 The fob you use on your keychain and the controller in your car both contain a tiny radio transmitter that sends a code to a receiver inside the garage when you press a button. The receiver inside the garage is attuned to the frequency of the transmitter, which commonly uses 300 or 400 MHz of power, and is similar to receivers used in remote-control toys. The 1950s brought a slew of transmitters to the market that were simple and sent a single signal out to the garage door opener. However, the simplicity of this system caused problems when garage door openers grew in popularity, as one transmitter could open any number of garage doors in separate homes. The 1970s brought a series of transmitters with varied frequencies. A DIP (dual in-line package) switch was inserted that included eight small switches soldered to the circuit board which could be switched to control the code sent by the transmitter. The pattern sent by the transmitter needed to match the receiver’s DIP switch in order for the garage door to open. However, these simple models did not provide enough security to protect homes from theft and trespassing. Transmitter’s controller chip has a memory location with a 40-bit code held inside. By pushing the button on the key fob, this code, along with a function code that instructs the garage door to perform a given action, transmits. The receiver also has a controller chip with memory capabilities that holds the 40-bit code. If this receiver detects the expected 40-bit code, it performs the transmitted function. New codes are generated by the pseudo-random number generator each time the transmitter sends a 40-bit code, which are then stored in memory in both the transmitter and receiver. By synchronizing the two, the codes update and maintain garage door security. Garage door security is essential, especially since the convenience of remote entry was introduced during the 1950s. With a radio transmitting system in place, your door will open when you, and only you, want it to, protecting both your home and peace of mind.